Box Text: The foundations of the universe are about to be violently shaken apart. A timeless prophecy threatens the order of galactic civilization, and one legendary race stands at the epicenter. You are Gideon Wyeth -- an unlikely hero who will become the catalyst for the transcendence of his kind. Download & find hidden Advent Rising icons to win $1,000,000 or hundreds of other cool prizes! Two month Xbox Live trial included in this package. While supplies last. Contest starts 6/9/05. 01-20-2019 silverbow Box Text The foundations of the universe are about to be violently shaken apart. A timeless prophecy threatens the order of galactic civilization, and one legendary race stands at the epicenter. You are Gideon Wyeth -- an unlikely hero who will become the catalyst for the transcendence of his kind. The Advent of Humanity Begins… • Stunning single-player game play presented with gorgeous cinematic design • Sweeping, evolving story by award-winning sci-fi author Orson Scott Card • 12 amazing weapons and 8 superhuman powers, all with unique alternate fire abilities • Intense vehicular combat as you fly, drive and battle with 3 incredible vehicles • Revolutionary Flick-Targeting allows for true combat freedom Race to Save Humanity! 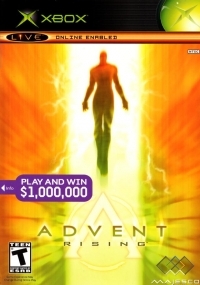 Download & find hidden Advent Rising icons to win $1,000,000 or hundreds of other cool prizes! Two month Xbox Live trial included in this package. While supplies last. Contest starts 6/9/05. This is a list of VGCollect users who have Advent Rising in their Collection. This is a list of VGCollect users who have Advent Rising in their Sell List. This is a list of VGCollect users who have Advent Rising in their Wish List.